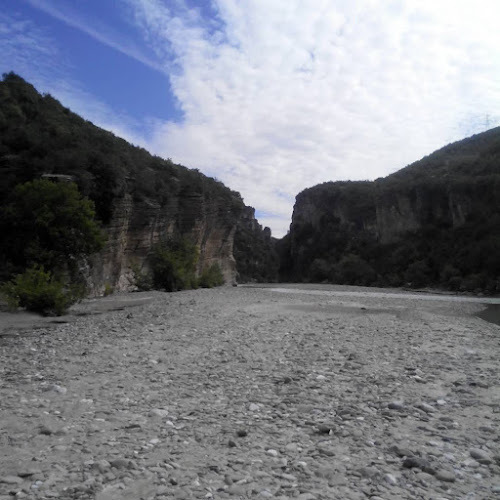 From Corovode go along the dirt road that goes up the river Skrapar and after 2 km you will reach the military area from which a dirt road goes down to the river in the vicinity of a small schooner. Here you can sail, kayak or take on Canyoning. And it is possible to embark earlier into the canyon but access is very inconvenient since the area is more wild, the banks of the river are very high and some passages are tricky. Corovode kayking in the springtime has alpine characteristics, constant slope, is rocky and technical. There are 2 miles of wild water grade III / IV continuously. When canyoneering, the canyons may be narrow and are very smooth and presents no hindrance or technical features. The river water is clean coming from the mountain area with little development around, but entering Corovode the water is pretty dirty, where you may find runoff and some garbage. About 500 meters before Corovode is a powerhouse in the process of finalizing the construction work. Period: Kayaking – spring brings ideal water levels after steady rain; Canyoning – is possible throughout the year, except during the period when the river level is high.